Janet Marie Waldo (February 4, 1919 – June 12, 2016) was an American radio and voice actress. She is best known in animation for voicing Judy Jetson, Nancy in Shazzan, Penelope Pitstop, and Josie in Josie and the Pussycats, and on radio as the title character in Meet Corliss Archer. Waldo was born in Yakima, Washington on February 4, 1919 (according to her family gravestone, although most sources, including the 1930 and 1940 census records, cite 1920). Her mother, Jane Althea Blodgett, was a singer trained at the Boston Conservatory of Music, and her father, Benjamin Franklin Waldo, was, according to Waldo family lore, a distant cousin of Ralph Waldo Emerson. Her elder sister, by just over seven months (if one uses the 1919 year of birth), Elisabeth Waldo, is an authority on pre-Columbian music and an award-winning composer-violinist who appeared in the film Song of Mexico (1945). 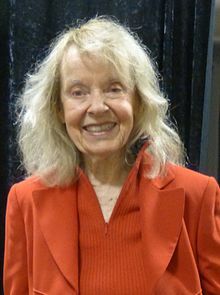 Janet Waldo attended the University of Washington, where her performance in a student theatrical garnered her an award and brought her to the attention of Bing Crosby. A Paramount Pictures talent scout, who was with Crosby at the time, signed Waldo for a screen test, which led to a contract with the studio. 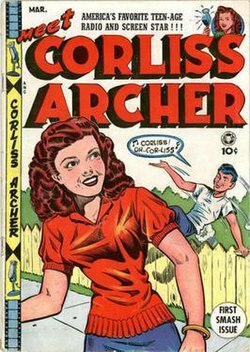 Al Feldstein, later the editor of Mad, was a writer-illustrator of the Meet Corliss Archer comic book. Waldo was depicted on the front cover twice, as herself and as Corliss. Waldo appeared in several films in uncredited bit parts and small roles, although she was the leading lady in three Westerns, two of them starring Tim Holt. Her big break came in radio with a part on Cecil B. DeMille's Lux Radio Theater. In her radio career, she lent her voice to many programs, including Edward G. Robinson's Big Town, The Eddie Bracken Show, Favorite Story, Four Star Playhouse, The Gallant Heart, One Man's Family, Sears Radio Theater and Stars over Hollywood. She co-starred with Jimmy Lydon in the CBS situation comedy Young Love (1949–50), and she had recurring roles on The Adventures of Ozzie and Harriet (as teenager Emmy Lou), The Red Skelton Show and People Are Funny. She recorded with jazz vocalist Mel Torme and his vocal group the Mel-Tones. However, it was her eight-year run starring as teenager Corliss Archer on CBS's Meet Corliss Archer that left a lasting impression, even though Shirley Temple starred in the film adaptations, Kiss and Tell and A Kiss for Corliss. The radio program was the CBS answer to NBC's popular A Date with Judy. Despite the long run of Meet Corliss Archer, fewer than 24 episodes are known to exist. Waldo later turned down the offer to portray Corliss in a television adaptation (the role was recast with Ann Baker taking the role for TV). In 1948, the Meet Corliss Archer comic book, using Waldo's likeness, published by Fox Feature Syndicate, appeared for a run of three issues from March to July 1948, using the original scripts. On April 1, 1948, Waldo married playwright Robert Edwin Lee, the writing partner of Jerome Lawrence. The couple had two children, and remained married until his death in 1994. Waldo made a rare on-screen television appearance when she appeared as Peggy, a teen smitten with Ricky Ricardo on a 1952 episode of I Love Lucy titled "The Young Fans" with Richard Crenna. Ten years later, Waldo again worked with Lucille Ball, this time playing Lucy Carmichael's sister, Marge, on The Lucy Show. That episode was titled "Lucy's Sister Pays A Visit". She also appeared on an episode of The Andy Griffith Show as Amanda. Waldo also reprised the role of Emmy Lou for some early TV episodes of The Adventures of Ozzie and Harriet. Later, she was the female lead opposite Anthony Franciosa in the short-lived sitcom Valentine's Day (1964). In television animation, she played Judy Jetson in all versions of the Hanna-Barbera television series The Jetsons. Waldo was the last surviving main cast member of the original The Jetsons series. In 1964–66, she took over the role of Pearl Slaghoople on The Flintstones, which was originally played by Verna Felton. Waldo reprised Mrs. Slaghoople on the Flintstones TV films I Yabba-Dabba Do! and Hollyrock-a-Bye Baby in the 1990s. She later provided the voices for Nancy in Shazzan, Granny Sweet in The Atom Ant/Secret Squirrel Show, Josie in Josie and the Pussycats and Josie and the Pussycats in Outer Space, Penelope Pitstop in both Wacky Races and The Perils of Penelope Pitstop. She later guest starred in Thundarr the Barbarian as Circe in the episode "Island of the Body Snatchers". Further guest starring roles include Beth Crane, a descendant of Ichabod Crane, in the episode "The Headless Horseman of Halloween" from The Scooby-Doo Show in 1976 and as Aggie Wilkins/Witch McCoy in the episode "The Ozark Witch Switch" in 1977. The following year she voiced both Arlene Wilcox, twin sister of the 'Witch of Salem' and the witch in the episode "To Switch a Witch " from the third season of Scooby Doo, Where Are You? in 1978. She voiced Morticia Addams in the short-lived 1973 cartoon series adaptation of The Addams Family. Waldo was the voice of Princess and Susan in the English-language version of Kagaku ninja tai Gatchaman, known as Battle of the Planets, and Hogatha in The Smurfs. In 1990, shortly after completing her role as Judy Jetson in Jetsons: The Movie, she was abruptly replaced with pop star Tiffany. The executive decision of Universal Pictures caused casting director Andrea Romano to say it was "a huge mistake on so many levels" and Romano asked that her name be removed from the credits. Romano received volumes of hate mail despite her stance on the casting change. Voice director Gordon Hunt reportedly asked Tiffany to sound more like Waldo. According to Iwao Takamoto by the time of the film's release, Tiffany's fame had waned. He quipped, "The punch line, of course, is that fifteen years after the fact, Janet Waldo is still working while for most people, saying the name Tiffany automatically brings to mind a lamp." Ultimately, Waldo patched things up with Hanna-Barbera and continued acting on their television series. The movie version of The Jetsons was a box-office flop and a critical failure with most of the negative reviews directed at Tiffany's acting and the replacement of the original voice of Judy Jetson. Waldo died on June 12, 2016 at the age of 97. She had been diagnosed with a benign but inoperable brain tumor five years before her death. She is interred at the Forest Lawn Memorial Park in the Hollywood Hills. 1946 Request Performance Janet "Abbott/Costello"
The Camel Screen Guild Theatre Girl "The Secret Heart"
1949 Screen Directors Playhouse Katie and Peggy Stephenson "The Exile" and "The Best Years of Our Lives"
Errand of Mercy Girl "Help For a Fighter"
Four Star Playhouse A number of characters "Corey"
1954 Stars over Hollywood Lovely woman "Miss Nettie"
1979 Alien Worlds Various characters "The Keeper of Eight"
1952 I Love Lucy Peggy Dawson "The Young Fans"
1962 Saints and Sinners Marion Simmons "Daddy's Girl"
1963 The Lucy Show Marge "Lucy's Sister Pays a Visit"
The Andy Griffith Show Amanda "A Wife For Andy"
Stewardess "The Riddle of the Gold"
1965 Please Don't Eat the Daisies Miss Reece "It's Lad by a Nose"
The Hillbilly Bears Goldilocks "Goldilocks and the Four Bears"
1966 Get Smart Telephone Operator "All in the Mind"
The F.B.I. Arlene Morgan "The Baby Sitter"
Petticoat Junction Violet Bentley "Young Love"
1967 The Fantastic Four Princess Pearla "The Micro World of Dr. Doom"
Space Ghost and Dino Boy Nancy "The Final Encounter"
1970 Julia Mrs. Appleton "Call Me by My Rightful Number"
Funky Phantom Widow Wilson "Haunt in Inn"
1973 The New Scooby Doo Movies Josie "The Haunted Showboat"
1974 Hong Kong Phooey The Mayor's Wife "Patty Cake, Patty Cake, Bakery Man"
1976 Jabberjaw The Queen of Atlantis "Atlantis, Get Lost"
1981 Thundarr the Barbarian Circe "Island of the Body Snatchers"
Rockin' with Judy Jetson Judy Jetson Alternative title: "Judy Jetson and the Rockers"
1998 King of the Hill Mrs. Tobbis "Pretty, Pretty Dresses"
^ Lee family notation, April 6, 2016. ^ "What the Music Critics Say About Elisabeth Waldo". Elisabeth Waldo Music. Retrieved June 13, 2016. ^ Weber, Bruce (July 9, 1994). "Robert E. Lee, 75, Playwright; 'Inherit the Wind' Co-Author". The New York Times. ^ Lawson, Tim; Persons, Alisa (2004). The Magic Behind the Voices. University Press of Mississippi. p. 319. ISBN 978-1578066964. ^ Takamoto, Iwao (2009). Iwao Takamoto: My Life with a Thousand Characters. University Press of Mississippi. p. 172. ISBN 1604731931. ^ Chang, Christina Y. (July 15, 1990). "For Some Readers, Tiffany Is No Jetson". Los Angeles Times. Retrieved June 28, 2016. ^ "Janet Waldo, Voice of Judy Jetson, Dies at 96", [sic] New York Times, June 13, 2016. This page is based on the Wikipedia article Janet Waldo; it is used under the Creative Commons Attribution-ShareAlike 3.0 Unported License (CC-BY-SA). You may redistribute it, verbatim or modified, providing that you comply with the terms of the CC-BY-SA.